If you are artistic and like to make projects, you might want to look into starting a side business to sell your own arts and crafts projects. Many people are looking for cute accessories or art and are willing to pay others who can create items for them. The key is to find a niche where people will be willing to spend money; if you can create crafts or art for your clients’ passion, you will find your business more likely to grow. My friend is a talented artist who loves animals. She combined her two loves and now draws portraits of pets. People either have her draw the animals alone, or they pose with the animals and have her draw a picture of the two of them together. In a society where some people treat their pets as their children, my friend has tapped into an expensive niche market and is able to make a nice living as well as do something that she loves and provide a valuable product to her customers. Likewise, my cousin is a stay at home mom to four children, ages 11, 8, 4 and 7 months. She makes decorated light switch covers. She simply buys light switch covers in bulk and covers them with pictures of favorite cartoon characters or sports logos and sells them around the Midwest at craft shows. She is able to work on the light switches at night and during nap time and even has her children help her. When she goes to craft shows, the entire family travels together and sells together. She turns a nice profit at every craft show. 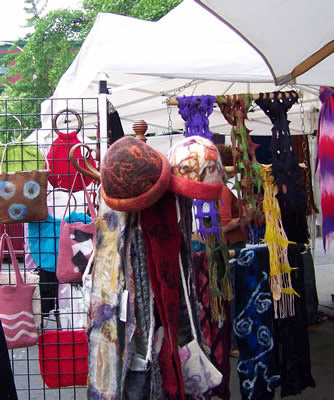 If you are looking to sell your own arts and crafts, you have several venues available. You could choose to sell on eBay, Etsy, at craft shows, or at art shows. In addition, consider where your customers might congregate. My friend leaves her business cards (which have a sample pet portrait on them) at veterinarian offices, as well as at grooming shops. She also attends dog shows and markets her product there. If you can create an arts or crafts project that taps into people’s passion (such as their pets or their favorite sports team), you may find yourself with a busy side business. Pay attention to the right places to market, and you could generate a nice side income while doing something that you love! Do you have an arts or crafts business that you'd like to tell us about? Share in the comments! *Photo by adiything via Flickr.